EBA newcomer Aloe Plus Lanzarote Conejeros added to their roster 24-year old Congolese power forward Karl Niamamoukoko (205-92) from CB Cazorla Jaen Paraiso Interior. In two EBA games in Spain he recorded 3.0ppg, 3.5rpg, 1.0spg and 1.5bpg last season. The previous (14-15) season Niamamoukoko was tested by Ourense (LEB Gold). He also played that season for Kenitra AC (D1) in Moroccan league. Niamamoukoko also spent pre-season at Cintra Plasencia that year. 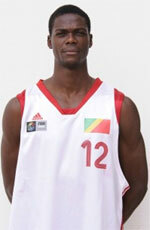 He represented Congo-Brazaville at the Afrobasket Championships in Abidjan (Ivory Coast) three years ago. His stats at that event were 5 games: 3.2ppg, 2.6rpg, 1.0bpg. Niamamoukoko's career allowed him to visit three different continents. He tasted the life as pro basketball player in Europe, Africa and of course North America. Niamamoukoko has played previously for five other teams: CB Fuenlabrada II, Getafe, Movistar Estudiantes Madrid B, CB Illescas and Majadahonda. Levallois Metropolitans (ProA) inked 30-year old former French international forward Nobel Boungou-Colo (202-88, agency: Interperformances). He has a double citizenship as he also holds Congolese passport. Boungou-Colo played most recently at Fiat Torino in Italian Serie A. In 10 games he recorded 6.3ppg, 3.4rpg and 1.2apg last season. He helped them to win the cup. Boungou-Colo also played for Real Betis (Liga Endesa) in league where in 9 games he averaged 13.0ppg, 4.0rpg, 1.0apg and 1.0spg. Boungou-Colo has tried to make it to the NBA and played in the NBA Pro Summer League in 2014. Among other achievements he won French ProA championship title in 2015. Boungou-Colo received also Eurobasket.com All-French ProA Player of the Year award and Eurobasket.com All-French ProA Domestic Player of the Year award back in 2014. He was a member of French Senior National Team between 2014 and 2015. Boungou-Colo has played previously professionally in Russia (Khimki) and France (Limoges CSP Elite, Le Mans, Sluc Nancy, Hyeres-Toulon and ADA Blois). Aloe Plus Lanzarote Conejeros (EBA) confirmed in their roster 26-year old Congolese power forward Karl Niamamoukoko (205-92). He has played there for the last two seasons. Niamamoukoko represented Congo-Brazaville at the Afrobasket Championships in Abidjan (Ivory Coast) five years ago. His stats at that event were 5 games: 3.2ppg, 2.6rpg, 1.0bpg. Niamamoukoko has played previously professionally also in Morocco (Kenitra AC) and Spain (Ourense, CB Fuenlabrada II, Viten Getafe Fuenlabrada Madrid, Plasencia and Movistar Estudiantes Madrid B). Levallois Metropolitans (ProA) is close to land 27-year old naturalized Congolese small forward Giovan Oniangue (197-91) who played last time at Boulazac Basket Dordogne. 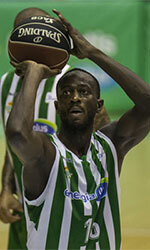 It will actually be his comeback to Levallois as he has played here before. In 28 ProA games he averaged 4.9ppg and 1.8rpg last season. Oniangue helped them to make it to the cup final. The previous (16-17) season he played at Levallois Metropolitans where in 11 ProA games he had 3.3ppg and 1.6rpg. Oniangue has tried to make it to the NBA and played in the NBA Pro Summer League in 2016. Among other achievements he received Afrobasket.com All-African Championships Honorable Mention award back in 2013. Oniangue represented France at the Afrobasket Championships in Abidjan (Ivory Coast) five years ago. His stats at that event were 5 games: 14.8ppg, 4.8rpg, 3.0apg, 1.8spg, FGP: 45.5%, 3PT: 26.8%, FT: 57.9%.